Jim. I have spent a lot of time with him, well,.. not actually with him. Jim was the son of a family friend. She passed away awhile ago, and Jim died many years before his mother. She was proud of him, and spoke often of his accomplishments and adventures. Jim devoted his life to the FBI. He was a young man when he started with the Bureau. He never married, and never had children. He was truly devoted to his job,… and his mother. 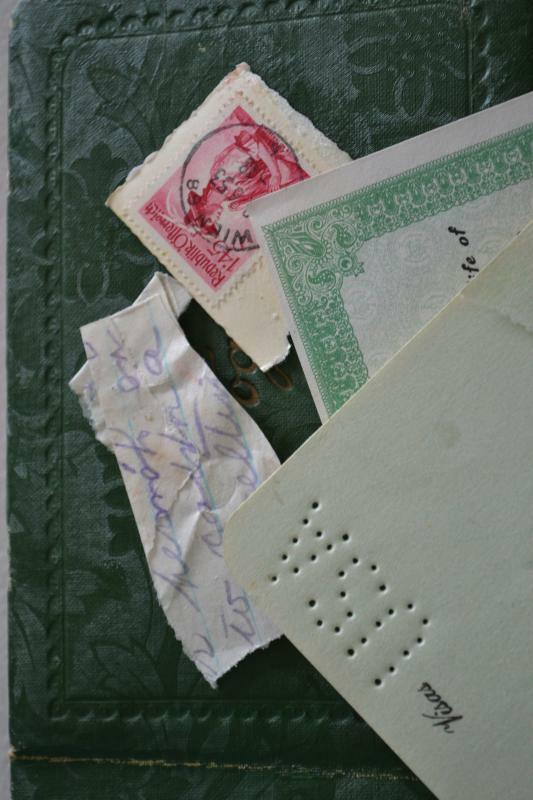 Jim wrote his mother letters and postcards with tidbits about exotic locations, and intriguing people. Jim, in fact corresponded with many folks, and they in turn kept in touch with Jim. Jim died a suspicious death,..in fact his mom told us “he’d been slipped a mickie”. This happened somewhere in New Mexico in the early 70s, if my memory serves me. You are probably wondering why I am sharing a little bit of Jim with you,… actually I share a lot of Jim. 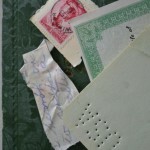 You see, after his mother passed away the boxes of postcards, letters, agent passports, photos, etc,…were passed to my family. The question was what do we do with the personal papers of this ghost of a man? After looking at the photos, and reading through the detailed travels it became apparent they were too interesting to discard. Also it would have felt like we were discarding Jim. Instead I have taken these pieces of Jim’s life, the life few knew about, and now they are in my collages. I’ve used Jim’s passport photos, along with letters, and picture postcards from his co-workers and friends in Rome, Berlin, Frankfurt, Moscow, etc.. and carefully placed the pieces in my collages. In a piece I finished recently ( Offshoot ) there is a letter written to Jim’s father from a friend in the 1920’s, but in this particular collage the true “piece de resistance” is Jim’s Geneva Convention Identification Card from the 1950’s. I never met Jim, but over time working with the scraps of his life I have learned he was a good man.